Home WordPress Updates, Articles, News & Blogs What’s new features in WordPress 4.7? WordPress has recently launched its new and the last version of the year: WordPress 4.7. It is named as “Vaughan” on honour of legendary jazz vocalist Sarah ‘Sassy’ Vaughan. It’s a great news for WordPress users and lovers that it has come up with many new exciting features. It is now available to download and update in your wordPres dashboard. Well, what’s new features on WordPress 4.7? 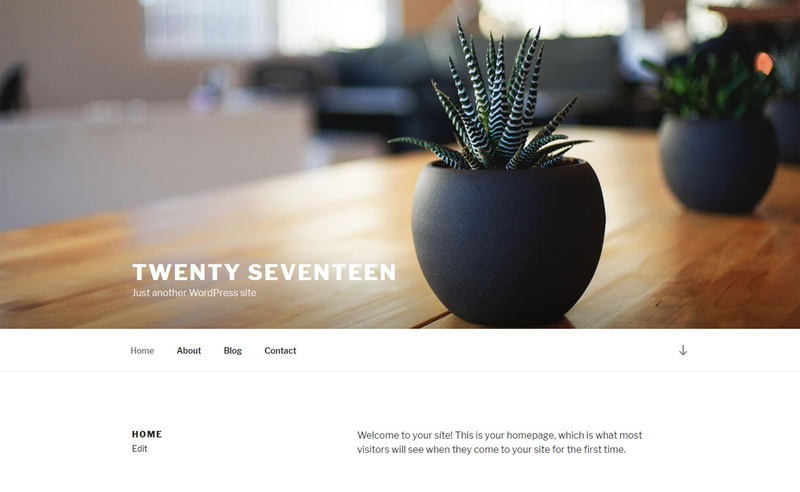 WordPress 4.7 has introduced Twenty Seventeen as its brand new default theme. This time the theme is designed focusing on business sites. Moreover, it is highly flexible and is appropriate for blogs and other creative sites too. Twenty Seventeen comes with header video and mesmerizing featured images that keep your website alive and stunning. It features multiple sections on the frontpage that are fully customizable – configure, enable or disable as per your need. Besides, it includes widgets, navigation, social menus, a logo, custom colors and much more. It is optimized for full comfort, you can translate it to any language and use it via any device, any browsers. It stands out anywhere and everywhere to meet a wide range of users. WordPress 4.7 now enables embedding video in the header of the themes. Users can easily add YouTube videos or upload their own videos in mp4 format. Here is how to use video header. WordPress 4.7 has introduced starter content functionality to WordPress themes. This helps users to sense out how their website will work and look like, before setting up their site. The starter content will be displayed when the user switches to theme customizer. This helps you to define which page you want as a static front page, what information widget you want to place where and much more. If you are final with your setup you can simply save and publish it. Here is more about starter content and how it works. WordPress 4.7 comes with additional CSS. Now the users can directly add CSS from the Customizer with a live preview and easily save & publish. Now the users can try different tweaks, live preview them and save the one that better fits your requirement. Allowing users to visualize changes made by them across the site, probably save the time and let them to exactly what they want. Here is more about better theme customization via custom CSS with live preview. WordPress 4.7 brings Edit Shortcut feature right from the Customizer with live preview. A visible icon appears on each section/element of the site which you can customize with live preview. Just you have to click on the edit icon on the section that you want to configure then you are directed to editing. Enjoy the faster customizing experience ever with WordPress 4.7. Here is more about edit shortcut feature. WordPress 4.7 brings more convenience in managing your documents. For those who have a relatively large WordPress site, it’s really difficult to distinguish the document you want from the all available as there was no indexing functionality. Now, in the new WordPress version as you upload PDFs it will generate thumbnail images so that you can easily get the document you are searching for from the collection. Here is more detail about the feature. 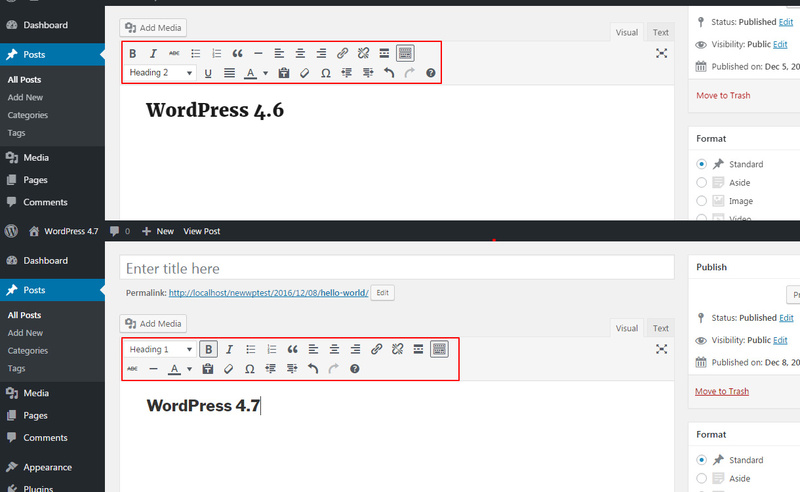 User will see few improvements in the post editors with WordPress 4.7. Now the toggle bar is keyboard shortcut ready. As you can see in the image below, the paragraph and heading selector menu has been moved to the top bar, underline and justify button has been removed and minor changes in editing button placement. REST API Content Endpoints is the most exciting improvement in WordPress 4.7 for developers. If you are a theme or plugin developer, you must check more on WP REST API. 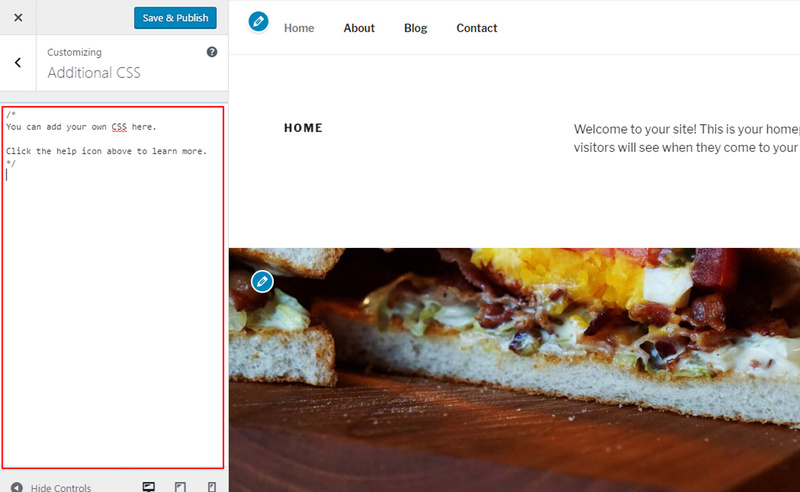 WordPress Custom page templates might not be a new thing for you as the WordPress supports this feature from very early. But now WordPress 4.7 has introduced post type template functionality to all post types, so the theme developers can enjoy more flexibility with the WordPress template hierarchy. Here is more about Post type Templates functionality in WordPress 4.7. These are some of the awaited features that you will get in WordPress 4.7. Besides this, there are many other improvements introduced in new WordPress version like changes in menu building, translation ready dashboard, overhauled codes and other backend tweaks. Here is more about WordPress 4.7. Hey Buddy!, I found this information for you: "What’s new features in WordPress 4.7?". Here is the website link: https://wpallclub.com/whats-new-features-on-wordpress-4-7/. Thank you.